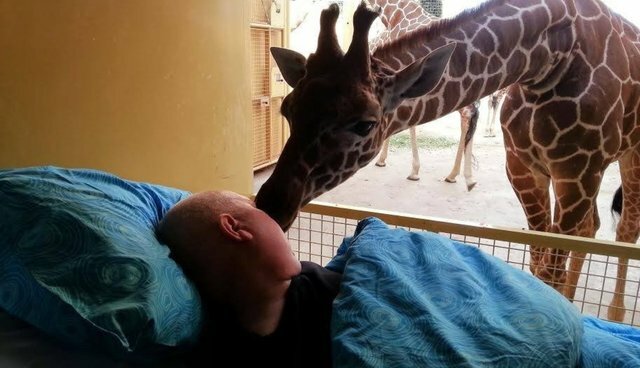 Giraffes bid an emotional farewell to a terminally ill man who had worked for decades cleaning out enclosures at the Rotterdam Zoo in the Netherlands. According to news site NLN.be, the 54-year-old named Mario, who is mentally disabled, had spent most of his life volunteering at the zoo until he was diagnosed with an untreatable form of cancer which has left him confined to a hospital bed. As his final wish, Mario asked for one last visit with the animals he'd worked among, and yesterday that wish was fulfilled. "A very special moment. You could see him totally light up. It's very special to see that those animals recognize him, and sense that he isn't doing well," says Kees Veldboer, director of the Ambulance Wish Foundation which made the visit possible. "It was very beautiful to be able to help this man fulfill his dying wish."